Just above the entrance to the 36th Street express station on 4th Avenue, Ines Bakery always has a lot of foot traffic in front and shows itself off only as a place to buy large designer cakes. Examples in the window are for weddings, quinceañeras, and birthdays.Without exception, I have overheard orders for cakes or cupcakes being places and/or finished orders being picked up each time I have eaten here. The bakery is famous in the area and folks from every background use them for their parties. I have heard a man place an order for a bar mitzvah, and last time in a Russian woman was ordering cupcakes for a party the next day. That being said, first and foremost in my mind are the great breakfasts at great prices available here. 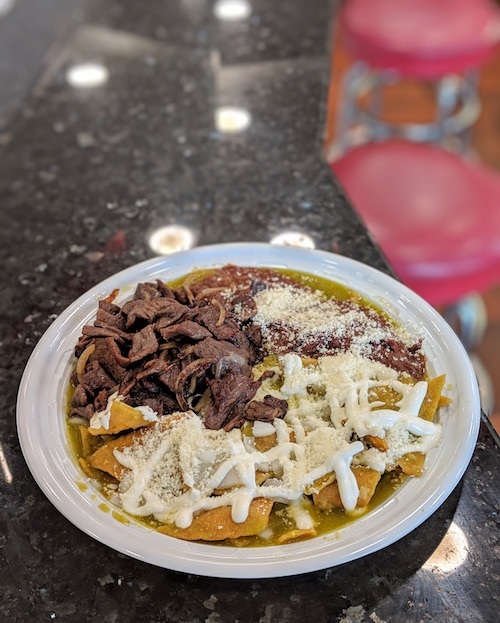 Depending on who is operating the cash register a plate of chilaquiles loaded with meat (below) runs $7 or $8. In addition a nice portion of beans will grace the plate in a puddle of either red or green salsa before being topped with crumbled cheese and sour cream. 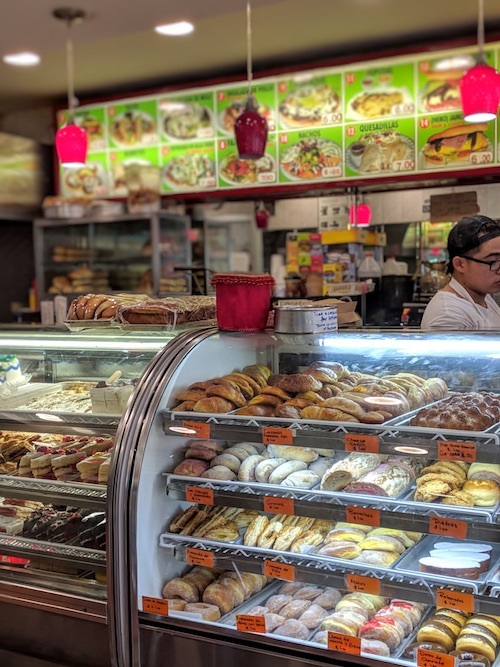 If you take your meal at the small counter, it is hard to keep your eyes off the display of pastries (see last photo below). 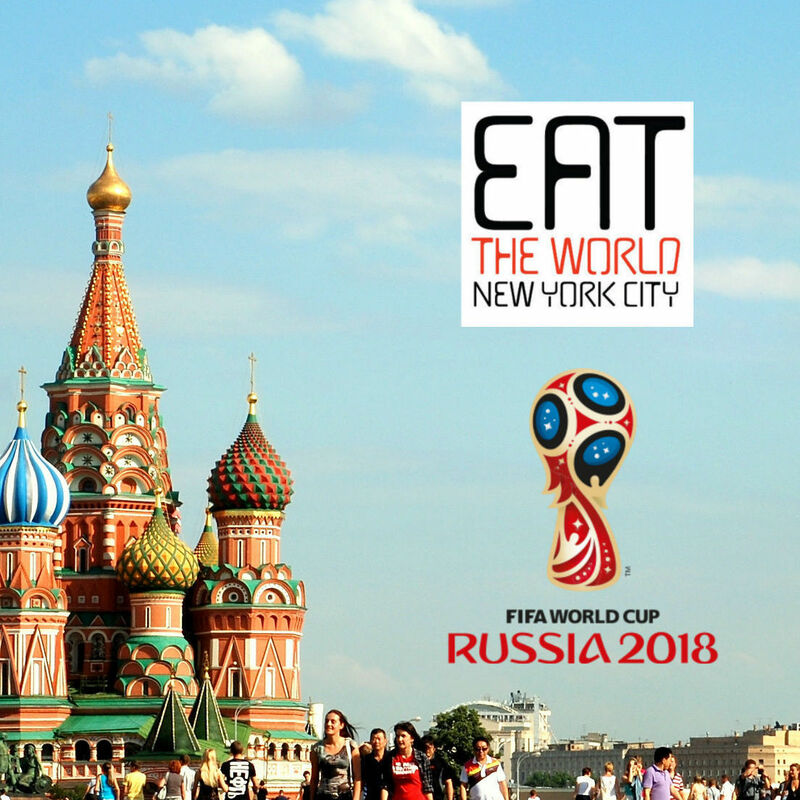 From empanadas to donuts to croissants and Mexican sweet breads, they seem to have something for everyone. 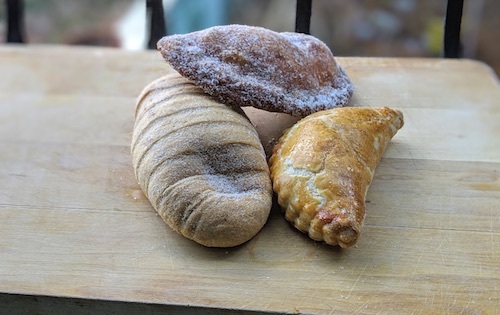 The selection below includes (from left to right) a gusano, which literally means "worm" and is filled with sugar and cinnamon, a sugar dusted empanada with arroz con leche inside, and a baked empanada with guava and cheese. The gusano ($1.25) is named of course because of the way it is scored before baking which creates the tubed pattern that resembles a worm. Inside, the bread is very soft and not overly sweet. I ate this the day after I bought it and thought it was still perfect after being warmed up just a bit. I had never before eaten an empanada de arroz con leche ($1.25, below), but found it very enjoyable. 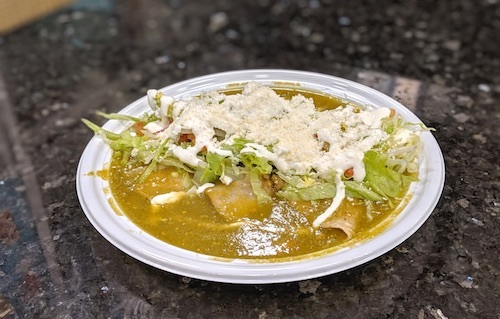 The kitchen churns out all manner of Mexican antojitos and some plates like enchiladas verdes ($8, below). Rather than being completely rolled like you usually see, the tortillas here are simply folded over once and the entire meat-filled wraps are again submerged in their good salsa verde. 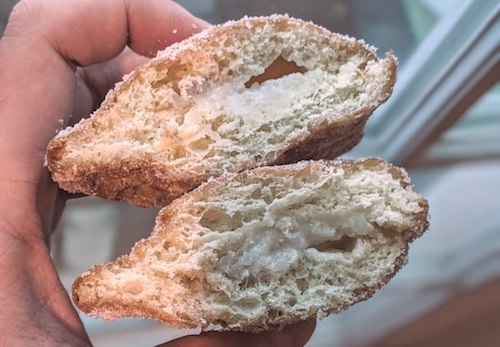 Both tortas and cemitas also seem to be popular here, which makes perfect sense seeing as how they make the most important part (pan) right here. And no matter what time of day or night, Ines Bakery will be open. 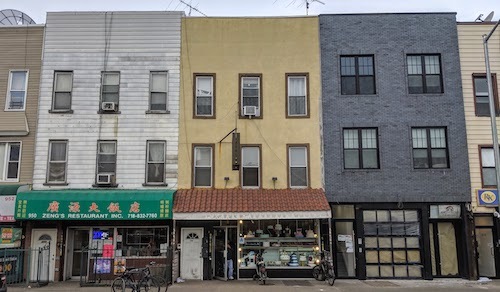 This is a savior for many of the neighborhood's residents who get home very late from work, you will randomly see the place packed even after midnight.